In my world soup must have two things: the soup itself must be full of flavor and topped with garnishes that are not only beautiful to look at but are a complement to the soup. 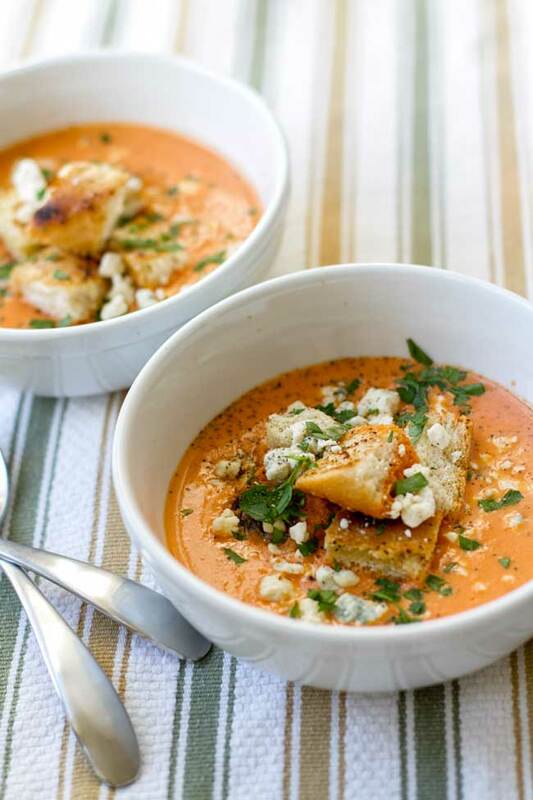 This roasted red pepper tomato bisque – a creamy soup thickened with a little flour – is delicious all on its own, but it’s the homemade croutons with blue cheese crumbles that really makes it special. Hello, New Year! How’d you get here so fast? I thought I’d start the New Year with soup. Simple, timeless, and tasty. Oh, and comforting – for me, there’s nothing more soothing than a warm bowl of creamy soup. Especially this time of year after all of the holiday hustle and bustle has faded and we’re left with holiday decorations to pack up, a house to get back in order, and jobs to return to here in just a few days. 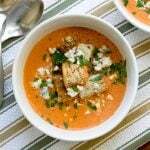 Its sort of a melancholy time and soup goes well with that, especially a roasted red pepper tomato bisque that’s garnished with homemade croutons and blue cheese crumbles. 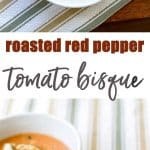 Jarred roasted red peppers: I love a short-cut and jarred roasted red peppers make this soup very easy to make. You can roast your own in a hot oven like a reader who made this recipe details in the comment section of this post. Vegetable stock: I used regular stock and you’ll notice there’s no added salt in the soup. If you use low-sodium vegetable stock or broth be sure to taste-test the soup and add additional salt, as needed. French bread: I like to make my own croutons because 1) they don’t take long at all to make and 2) they’re softer than the ones sold at the grocery store. Plus, making your own means you can customize them to your taste by tossing them with different spices and seasonings. Blue Cheese Crumbles: I love the tangy blue cheese crumbles with the creamy soup. Heavy Cream: Right at the end, after the soup has simmered and before it’s served, add the cream. It gives the soup its velvety texture and helps balance all the acidity from the tomatoes and peppers. If you want to make the soup ahead to serve later, be sure to freeze the soup without the cream. To reheat, just gently warm the soup on the stove and stir the cream before serving and top with the garnishes. 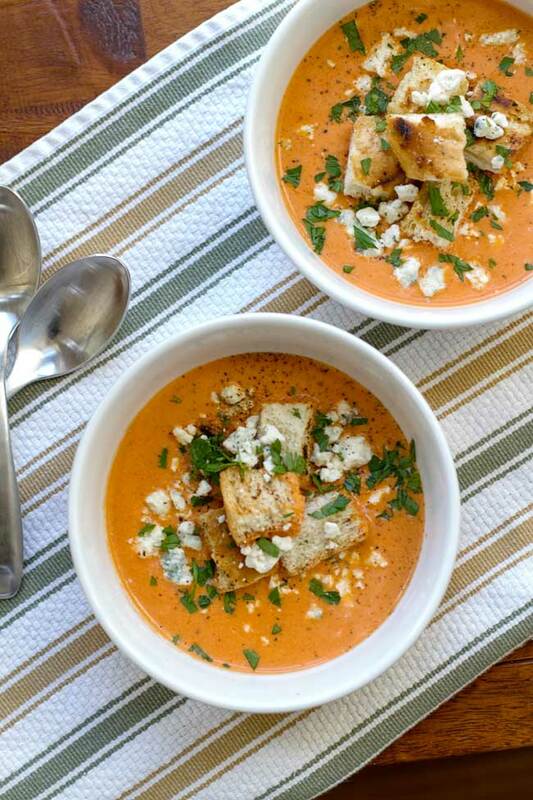 A creamy roasted red pepper and tomato bisque garnished with croutons and blue cheese crumbles. Melt the butter in a large pot over medium heat. Add the chopped onion, carrot, and celery. Cook the vegetables until they start to soften about 5-10 minutes. Add the flour to the vegetables and stir. Add the red peppers, tomatoes, and herbs. Break up the tomatoes with a spatula and let it all cook together for 2 to 3 minutes. Add the stock and bring the pot to a simmer. Simmer the soup for 30 minutes, stirring occasionally. In a separate pan, heat the olive oil over medium heat. Add in the smashed garlic and let it cook for a few minutes in the oil (keep it moving around the pan). After a couple of minutes, transfer the garlic to the other pot with the soup, reserving the oil. Add the bread cubes to the pan and toss to coat them in the oil. Season them with a few pinches of salt and pepper. Toast the cubes in the pan for just a few minutes. Keep a close eye on them because they can burn easily. Once toasted, remove the croutons from the pan and set aside. Once the soup has simmered for 30 minutes, remove the parsley, thyme stems, and bay leaf. Puree the soup using an immersion blender or stand blender. Wipe out the stockpot and pour the soup back into the pot through a fine mesh strainer. Discard the solids. Reheat the soup over medium heat. Once warmed, add the cream. Top each serving with the croutons, blue cheese crumbles, and chopped parsley. The soup will keep in the refrigerator for up to 3 days. You can also freeze the soup without the cream. Once the soup is strained, transfer it to freezer containers. To serve, gently reheat the soup on the stove. Add the cream, garnishes, and serve. I just made this. It was fantastic! I did not make the croutons and did not do the blue cheese. We just ate them with grilled cheese sandwiches. They had a ton of flavor and parents and kids both were happy! HUGE step up from plain tomato soup. I make this every year for a “soup club” that I’m in. The blue cheese is amazing in it! I don’t strain it, texture and taste is wonderful without the extra step. Absolutely love this recipe!! I used Feta instead of blue cheese, it’s all I had on hand. Turned out wonderfully, will definitely make again. This was so easy and wonderfully delicious. I loved the blue cheese crumbles. I went organic and roasted my own peppers. I didn’t bother to skin, just followed the directions and after simmering, placed ingredients in my nutri bullet which gave it a wonderful texture. LOVE that this has a dose of roasted red peppers to it – one of my favorite things! Love the suggestion to serve with blue cheese crumbles, too! Happy that it’s soup weather! Three cheers for soup weather! A super set of harmonious ingredients that souund and look delicious, although I would have to skip the blue cheese it really is not my thing. It’s pretty wonderful with the blue cheese, but I bet feta would be just as good! YUM! Tomato soup is my husbands favorite. I’ll need to make this recipe for him soon. This looks amazing April, can’t wait to try it. This bisque looks fantastic! I love the croutons and toppings on it. We have lot of peppers and tomatoes so this may be coming to our dinner table soon. Hope you give it a try – let me know what you think! This looks amazing! I would love a big bowl of this right now! Recently made this soup and it’s terrific. Blue Cheese crumbles are great on top , but the best part is the heavenly smells that fill the kitchen! Great recipe! Can’t wait to make it for friends. So blue cheese on red pepper and tomato soup is brilliant. I need to make this immediately. Oh, I just saw this on Instagram and had to check your recipe, looks so incredible! Great job!